If you’re a youth ministry leader, you could probably add a host of questions to this list—questions you’ve received from well-meaning (or at times concerned) parents who are depending on you to teach the Bible to their kids. Maybe these questions excite you because you sometimes wonder whether anyone cares what you teach. Or maybe they frustrate you because you work so hard to craft a discipleship plan in your ministry and parents don’t seem to understand where you’re headed. Recently in my own church I realized we needed to right-size parents’ expectations for what we can—and cannot—do in the time we have with their kids in our ministry. Not only because we’re volunteer led, but also because, like many ministries, the actual time we have with their kids is fairly limited. Youth ministry looks different today from the decades when parents were teenagers, and one of the biggest changes is a decrease in overall time spent in programmed gatherings. Parents are too important to leave in the dark on what really happens in your ministry when it comes to the Bible. Parents matter to your ministry, and they’re typically the greatest influences on their kids’ faith. But how can you truly partner with them when it comes to teaching Scripture? Here are six steps you can take, followed by a host of practical ideas you can share with parents, foster parents, and grandparents to use on their own. We are shaped by the story of Scripture. We can remind families about these values and connect our—and their—engagement of the Bible with them. Sometimes in the week-to-week grind we forget about why particular practices and traditions matter so much. When this happens, a rhythm like Bible reading can either lose its power or disappear altogether from our routines. Reminding and inspiring parents about the “why” can renew their energy for the “how” in their homes, and perhaps reenergize their commitment to participate in some of our ministries and the broader church. You probably have a plan for how you teach the Bible in your ministry. Maybe it’s predetermined by denominational resources or follows a particular rhythm. Perhaps you plan it one season at a time. In our middle school ministry, we walk through a three-year repeating cycle. The first takes us Genesis-Revelation through the Bible as a whole. The second year zooms in specifically on Jesus' life and teachings (this year through Mark). Finally, the third year focuses on communal and personal Christian practices and their scriptural foundation. At one point this past year, I realized that the parents in our ministry didn’t know about this cycle. Not because they were uninterested, but because we hadn’t told them. I’m trying to be more consistent about clueing them into the rhythm of our teaching and what they can expect from us (more on level-setting expectations below). Need help developing a teaching arc? Our church’s children’s ministry follows a formation model which repeats the same storytelling sequence year after year, with some variation. It’s a powerful approach which values the capacity of children for wonder and spiritual insight. While those kids who have had experience in this ministry develop a great oral familiarity with many of the stories of Scripture (a real gift), most of our students don't seem to have much experience with the Bible itself. Many of us have used kids' Bibles in our homes (and maybe it's been a while since we've done that), or maybe we've read the Bible out loud, but our kids haven't read from a full Bible much on their own. What we notice in our gatherings is that we need to help students find passages, and learn how to identify them, and couch this in moments of brief explanation of how the stories and books fit within the whole. Daunting, but fun! 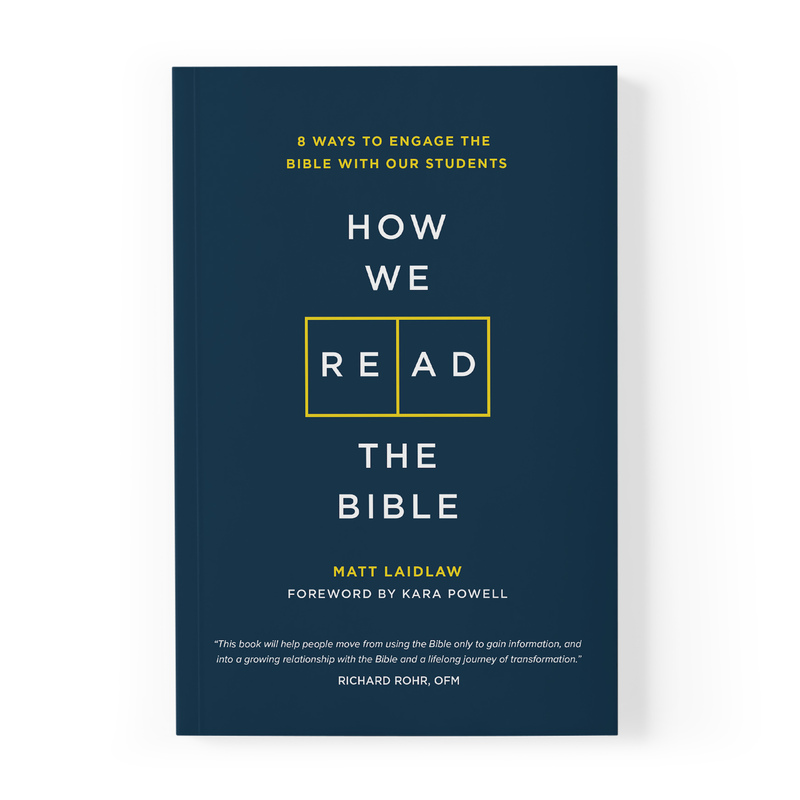 To say this another way, we want students to learn their way around the Bible, and also want to acknowledge that it’s challenging to help an early adolescent transition from hearing stories or reading them in abridged Bibles to finding and reading them in the context of the whole text. We can’t possibly accomplish this goal in the limited time we have with students on Sunday mornings, which leads to the next point. Parents may have unrealistic expectations that your team can work miracles in the span of the ministry time you have available—not to mention the reality that you’re working with preteens and/or teenagers. Depending on what else you do during your gathered program, you may end up with a very limited time actually devoted to reading, studying, contemplating, or teaching from the text. We CAN attempt to incite interest, invoke wonder, and create a safe space for questions. We won't entertain, but we will do our best to engage, reflect, and help them encounter the text in different ways. We CAN read and study texts together—sometimes up to a chapter, but often less, or skipping content in order to catch a story that evolves across a few chapters. We CAN teach some basic Bible knowledge—how to find passages, how to read the text, how the pieces fit together, some Bible history ... but we have to keep it very simple given our time and rhythms (and the audience). We CAN'T read nearly enough to really get the whole story in many cases. And by necessity we will skip broad swaths of the Bible in order to hit high points of the whole story. We CAN'T make up for the reality that not every student is present every week, and therefore each particular kid is likely to miss parts and miss how stories fit together. We CAN'T, realistically, be the primary source of either education or formation for your kids when it comes to Scripture. Our time together is helpful, but it's not robust. We couch all of this in the trust that we have all the time we need because the arc of formation is long. We also trust that the rhythms of discipleship, serving, and worship are all playing important and holistic roles in their formation. Your ministry might be different, and you may study the Bible intensively in small groups or Sunday school. Whatever you do or don’t do, give parents an honest peek behind the curtain. Then they can decide how much they will commit to rounding out deeper Scripture engagement in other ways. Without shaming, blaming, or laying heavy burdens on parents, we can invite them to go deeper with the Bible in their family and equip them with ideas they can use. Sometimes it takes a new approach, while other times a reminder is enough to kickstart family Bible engagement. Here are a few ideas you can share directly with parents. Offer suggestions for student Bibles that align with translations you’re using at church for consistency. At your next parent meeting, make a few Bibles available for parents to pick up and review. And if you find a Bible or Bible-based prayer app you’re loving, share it with parents via email or however you’re regularly communicating with them. Finally, take a posture of cheering parents on. Encourage their efforts to read the Bible at home, however small. Invite them to share ideas with you and with other parents, and to ask for more ideas when they run into roadblocks or challenging questions. Reaffirm that youth ministry is a partnership between the church and family. Discipleship is sweeter as a shared journey. The Bible doesn’t need to be a source of embarrassment or judgment, either for parents or for your ministry. Naming Bible engagement as joint endeavor may help you rediscover its beauty together. How do you talk with parents about Scripture in your ministry, or help them read it at home? Brad M. Griffin is the Director of the Fuller Youth Institute, where he develops research-based training for youth workers and parents. A speaker, blogger, and volunteer youth pastor, Brad is the coauthor of Growing Young, several Sticky Faith ​books, Right Click: Parenting Your Teenager in a Digital Media World, and the series Can I Ask That? : 8 Hard Questions about God and Faith. Brad and his family live in Southern California.